One of the problems I've had with my American most of the time I've had it is a very rough hot idle. Through some investigation, I found out that I had a loose intake manifold. I tightened it down and the problem got much better but was still there (and has slowly been getting worse again). As it turns out, I'm not the first person to experience this problem. AMC actually issued a service bulletin on this problem back in 1969. Remove the carburetor and any heater hoses going to the intake manifold.. Remove the intake and exhaust manifolds and clean the manifold and cylinder head mating surfaces. Note that AMC did not use an exhaust manifold gasket so don't be surprised if it isn't there. Separate the intake and exhaust manifolds. WARNING! If the manifolds haven't been separated before or if it's been a long time, chances are good that you'll have a least one stud break on you during this process. Clean the intake to exhaust manifold mating surface to remove all of the old gasket. WARNING! The factory gasket was made of asbestos. If you are not 100% sure that it has been replaced with one that is non-asbestos, make sure that you wear a respirator and clean up all of the debris to prevent exposure. Install a new exhaust donut gasket and place the exhaust manifold on the engine and exhaust pipe making sure that the donut is centered in the end of the muffler. Just start the bolts that go into the exhaust manifold. They only need to go in a turn or two for now. Install a new intake to exhaust manifold gasket. Install a new intake manifold gasket on the engine (make sure it stays on the alignment pins) and loosely install the manifold. You will need to wiggle the manifolds around quite a bit to get the intake manifold over the alignment pins. Install the remaining fasteners and snug them up in the sequence shown below. 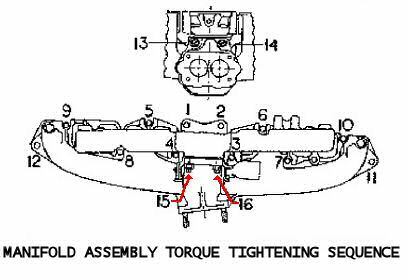 Torque each fastener to 25 ft. lbs following the sequence show below. Install the carburetor (be sure to use fresh gaskets) and any removed heater hoses. Set engine idle speed and fuel mixture.